Birds enthrall us with their stunning plumage, amusing antics, and lilting song. Avian art inspires in endlessly novel ways, too, evoking the freedom of flight and the fragility of their earthbound existence. Artists from throughout the world push themselves to new heights, striving to be selected for the internationally renowned Birds in Art exhibition. The 43rd annual exhibition celebrates avian marvels through new interpretations – in an array of mediums, including oil, watercolor, the graphic arts, bronze, stone, and others – created within the last three years. 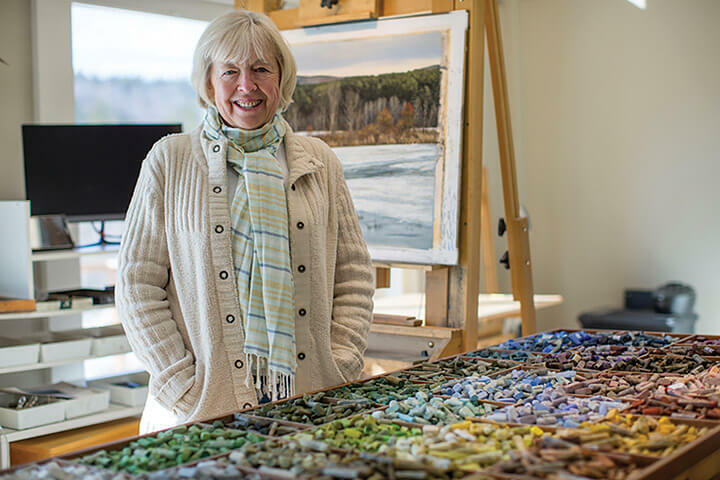 On March 8, the Leigh Yawkey Woodson Art Museum announced New England pastel artist Cindy House as its 2018 Master Artist who will be honored during the Museum’s 43rd annual “Birds in Art” exhibition this fall. House, the Woodson Art Museum’s 37th Master Artist, received the Master Wildlife Artist Medal during the “Birds in Art” opening festivities. For additional information about the exhibition and Cindy House see the 2018 Birds in Art press release and the 2018 Master Artist press release. Artwork for the Birds in Art exhibition is selected each year in May; see this list of 2018 Birds in Art artists’ names whose work is included in the 2018 exhibition. A fully illustrated catalogue accompanies Birds in Art and is available for purchase via this link or at the Museum. Opening day, Saturday, September 8, part of Wausau’s Artrageous Weekend, provided varied opportunities to interact with more than seventy Birds in Art artists visiting from throughout the world. More than seventy worldwide artists converged for Birds in Art opening festivities. Visitors mingled and renewed artist acquaintances, formed new friendships, and got catalogues and posters signed. Wise “early birds” made Birds in Art their first stop of Wausau’s Artrageous Weekend. The Museum’s 37th Master Artist Cindy House provided insights into her inspiration and process during this presentation. Birds in Art artists demystified processes during Artists in Action, demonstrating their work in various mediums beneath tents in the sculpture garden. The 2018 exhibition presents artworks by 114 artists in total: 2018 Master Artist Cindy House, 21 who were named Master Artists during previous “Birds in Art” exhibitions, and 92 artists whose work was selected by three jurors who reviewed 904 entries submitted by 575 artists. Innovative artistic approaches and intriguing mediums – from acrylic and oxidized sterling silver leaf to cut turkey feathers and oil and cold wax on linen – capture the character, spirit, and habitats of birds. A luminous, elegant oil painting by Michael Dumas highlights a house sparrow pair atop layers of fabric, while a whimsical wire artwork by Thomas Hill depicts a wild-eyed, gangly heron running. All-new artwork features varied interpretations of avian wonders – from vibrant to serene – via original paintings, sculptures, and graphics created within the last three years. This year’s “Birds in Art” exhibition includes 31 international artists, 8 Wisconsin artists, and 12 first-time “Birds in Art” artists. The 8 Wisconsin artists are Gary Eigenberger, Green Bay; Terrill A. Knaack, Beaver Dam; S.V. Medaris, Mount Horeb; John Miller, Madison; Katie Musolff, Stoddard; Don Rambadt, Milwaukee; Thomas R. Schultz, Green Lake; and Jan McAllaster Stommes, Owen. Two “Birds in Art” artists will lead public programs during artist residencies this fall. Kris Parins will share watercolor techniques during her residency, October 2-7. Josh Guge will highlight woodcarving during his residency, November 1-4. California-based artist and science illustrator Jane Kim, who recently completed a mural at the Cornell University Lab of Ornithology celebrating the evolution and diversity of birds, will design and paint a mural for the Woodson Art Museum focusing on how birds get their color. Her residency will take place November 9-18 and coincides with the publication of “The Wall of Birds” (Harper Collins), detailing Kim’s Cornell Lab of Ornithology project. For program details, check the events calendar in late August at https://www.lywam.org/events-calendar/. Birds in Art is an international juried exhibition organized annually by the Woodson Art Museum. Thanks to the members, donors, grantors, and sponsors supporting the 2018 exhibition and programs. Support for Birds in Art 2018 comes from Aspirus, Inc. and Aspirus Arise. Additional exhibition and educational support comes from Jim and Sue Konkel, and additional educational support comes from Gary and Amy Sweet. Birds in Art 2018 media support comes from Wisconsin Public Radio. Marketing supported in part by City of Wausau Room Tax funds. Exhibitions and programs are supported in part by a grant from the Wisconsin Arts Board with funds from the State of Wisconsin and the National Endowment for the Arts. Support for the Jane Kim mural project comes from the Community Arts Grant Program of the Community Foundation of North Central Wisconsin, with funds provided by the Wisconsin Arts Board, a state agency; the Community Foundation; and the B. A. & Esther Greenheck Foundation. A grant from the B. A. & Esther Greenheck Foundation supports the Kris Parins and Josh Guge artists residencies.